Who invented the Battery? The name of the person credited with inventing the Battery is Alessandro Volta (1745 - 1827). Alessandro Volta is not only famous as the Italian inventor of the Battery but also as a chemist and physicist. When was the Battery invented? Alessandro Volta invented a charge-generating machine called the electric pile, the forerunner of the modern battery in 1800, during the Industrial Revolution period of invention (1700 - 1860). The invention of the Battery originated in Italy and is considered a paramount achievement to the field of Science. The terms volt and voltage were derived from the name of Alessandro Volta. Definition of the Battery: The Battery is defined as a scientific device that produces electricity that stores energy and makes it available in an electrical form. A battery converts chemical energy into electric energy. An electric battery may have several primary or secondary cells arranged in parallel or series. Fact 1: Who invented the Battery? The Battery was invented by Alessandro Volta in 1800 during the Industrial Revolution era of invention(1700 - 1860) and was a major addition to advancements made in the area of Science. Fact 2: Who invented the Battery? The invention of the Battery by Alessandro Volta in 1800, provided a source of continuous current that paved the way for important scientific research and the development of numerous inventions. Fact 3: Who invented the Battery? The inventor of the Battery, Alessandro Volta, was born on February 18, 1745 in Como, Italy and died on March 5, 1827. Fact 4: Who invented the Battery? The early years of Alessandro Volta were spent in Como, Italy where he was raised by his patrician family of Filippo and Maddalena dei Conti Inzaghi. Alessandro Volta was educated at Benzi Seminary where he began to study electricity. Fact 5: Who invented the Battery? Following his education in 1774 Alessandro Volta was appointed professor of physics of the high school in Como. Fact 6: Who invented the Battery? His interest in physics and chemistry led to correspondence on electricity with the clergyman and physicist Abbe Jean-Antoine Nollet (1700 – 1770) in Paris and later with another physicist Professor Giovanni Battista Beccaria (1716 - 1781) at the University of Turin. Fact 7: Who invented the Battery? On September 22, 1774 Alessandro Volta married Donna Maria Alonsa Teresa Peregrini and the couple went on to have three sons. Fact 8: Who invented the Battery? In the same year as his marriage, Alessandro Volta was appointed director of the Royal School in Como where he became professor of Physics in 1775. Fact 9: Who invented the Battery? In 1776 Alessandro Volta observed the bubbling of methane and began experimenting with marsh gas that led to the development of Volta's 'electric pistol'. Fact 10: Who invented the Battery? Volta's 'electric pistol' was a invented from an attempt to build a new weapon. Volta's 'electric pistol' consisted of a glass container in the form of a pistol sealed with a tap, in which a spark fired a mixture of hydrogen and oxygen. Fact 11: Who invented the Battery? In 1779 Alessandro Volta accepted the position of professor in physics at the prestigious University of Pavia, a post he would hold for the next forty years. Fact 12: Who invented the Battery? 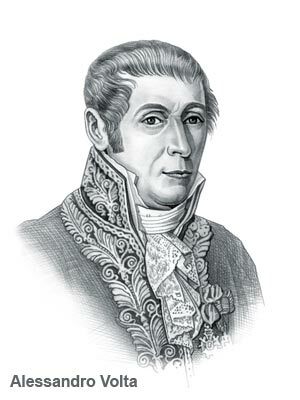 In 1800 Alessandro Volta invented the Voltaic Pile battery. The Voltaic Pile was the very first direct current battery. Fact 13: Who invented the Battery? The Voltaic Pile battery was made of alternating disks of zince and copper, with pieces of cardboard drenched in a saline solution. Attaching a wire to the ends of the device produced a continuous current of low intensity. Fact 14: Who invented the Battery? The Voltaic Pile, the first direct current battery, proved that electricity did not come from the animal tissue - a theory expounded by Luigi Galvani. Alessandro Volta proved that electricity came from contact of various metals, brass and iron, in moist surroundings. Fact 15: Who invented the Battery? The invention of the Voltaic Pile battery gave rise to electromagnetism, electrochemistry, and contemporary electricity inventions and applications. Research on electromagnetism (the interaction of electric currents or fields and magnetic fields) and any practical use of electricity required a source of continuous current - all made possible by the invention of the Voltaic Pile battery. Fact 16: Who invented the Battery? The invention of the Voltaic Pile Battery provided scientists with the ability to produce electric currents changed the field of science and technology. Fact 17: Who invented the Battery? Alessandro Volta did not stop with the invention of the Battery. He then invented of the Condenser, a high-sensitive device that stored electrical energy. Fact 18: Who invented the Battery? Alessandro Volta received enjoyed unparalleled success a physicist and as an inventor of scientific instruments. He was showed with accolades and honors. On October 11, 1810 he was granted the title of Count. Fact 19: Who invented the Battery? Alessandro Volta retired to the family estate in 1819 until his death on March 5, 1827. We hope that the facts in this article have provided the answers to all of your questions about the invention and its famous inventor, Alessandro Volta.